You know one of the simplest ways to cut down on your grocery budget is to stop wasting food. I know it sounds like a simple concept, but at the same time, it can be easy to let foods just waste away on the plate or in the freezer. We’ve been guilty of this in the past. If we have to clean out our fridge once a month and throw out a bunch of spoiled, unused or moldy stuff then we are wasting food… and money. But worry no more! Here are few ways to cut down waste on foods that will make your wallet happy! So check them below and let me know what you think. I’m the kind of person who can’t live without jams and condiments at home. They’re essential. Luckily, I found this tip on how can I easily lengthen the shelf life of my precious one by helping to prevent mold. If there’s something that really goes well with any dish, it’s cheese! But when molds grow, it can ruin the whole thing. The worse part is you never notice it until you’re ready to use it. 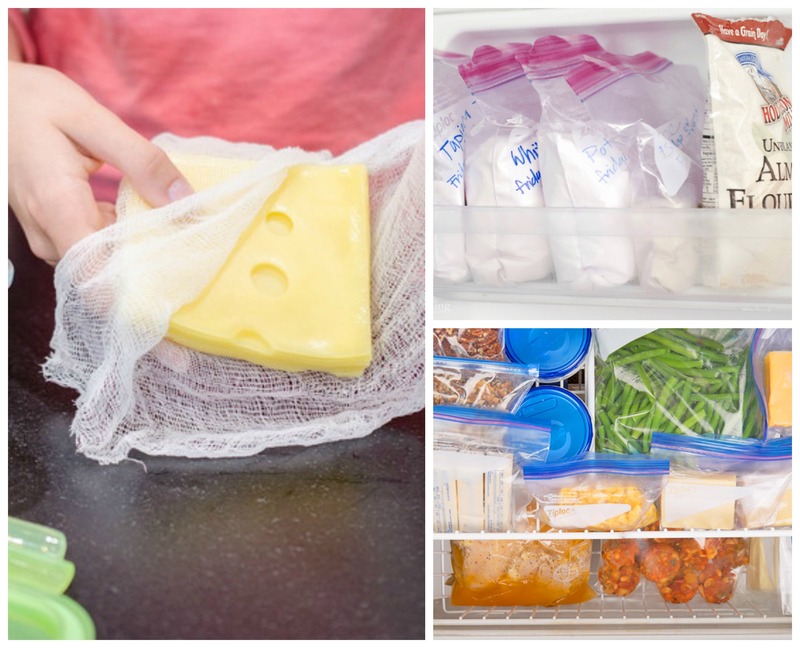 This vinegar soaked cheesecloth hack is brilliant for keeping the cheese last longer. If baking is your thing, (count me in) then this tip is a must for you. The refrigerator is a very good storage area for flour, but the use of a sealed container is even more important to prevent the flour from absorbing moisture as well as armoas and flavors from other foods in the refrigerator. This simple hack leads to fresher flour longer. Pickles come in all shapes, sizes and tastes and I love how absolutely easy they are to make. Using your scrap vegetables cut into sticks, you can’t go wrong with this. Save carrots skin, potato peels, onion ends and celery tops to add to your vegetable stock. Keep it in a bag and freeze it. Once the bag is full, it’s time to make a tasty vegetable soup perfect for cold weather. Soups are one of the easiest and most reliable dishes to freeze. And by reliable, I mean that you can come home from work, warm up a bowl of frozen soup, and know without a doubt that it will be delicious! So make a double batch of your favorite soup and freeze some for later. I know what you think right now, this tip is a bit silly. Yes, pantyhose can actually store your onions fresh up until 8 months. So instead of throwing your old worn stocks away, try giving it a new life. I’m sure that you like to have some fresh-tasting herbs in your kitchen, I know I do! Follow these steps and you’ll have frozen herbs in olive oil. It’s remarkably easy and works out great! Whether you make homemade potato chips or fries, this is a great find. Throw some potato peels in the oven, and they crisp up into delicious bites. You definitely need to try this snack, it tastes so good! Reward yourself with a grab-and-go lunch packed inside a cool mason jar. Layered those leftovers like bacon, spinach and ranch and you’ll have a delicious and satisfying treat. Instead of throwing away stale leftover foods, put them to good use and use your leftovers in new recipes to cut down on food waste.The best part of this is how much money you would save. So it’s a total win-win scenario. What other tips can you add? Comment down below and let me know what you think. As always, if you have any questions I’d always love to help.